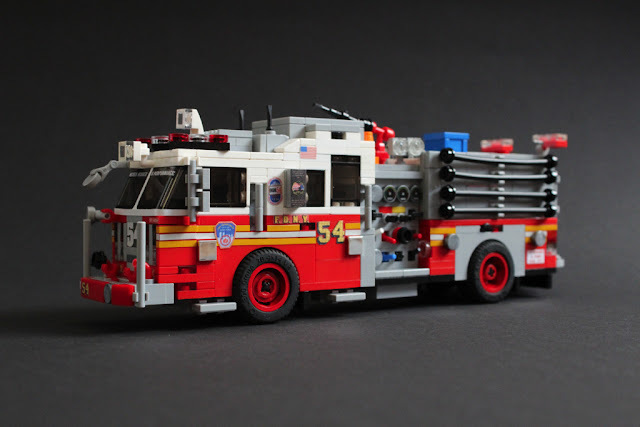 This realistic minifigure-scale fire truck MOC was recently shared by flickr.com user sponki25 in his photo-stream. According to the description this MOC is named after FDNY Engine 54 and dedicated to the fallen on 9/11/01. The detailing on the vehicle is very impressive as well as decals around the MOC that are accurate to the real vehicle. The builder also shared other iconic vehicles of New York City before, so don't forget to check out his photo-stream.